Take in the grand monuments of Washington DC, illuminated after dark. 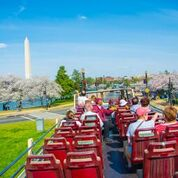 Our 2-hour guided Night Tour departs from Stop #20: White House and Stop #1: Union Station, both at 7:30pm. Please note that the night tour is not a hop-on, hop-off tour. Free Wi-Fi available on all buses. 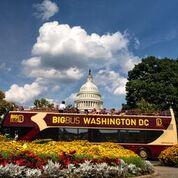 Show you Big Bus ticket at any Washington DC Corner Bakery Café to receive a free regular-sized coffee, and trade in your Big Bus-Garrett Popcorn voucher to receive a free treat bag of Garrett Mix at Garrett Popcorn.